Quieter, more compact gear boxes with improved power transmission remains an important goal for all gear manufacturers. One critical way to achieving these qualities is through the heat treatment and hardening of gears to the range of 50 to 62 Rc. Heat treated gears provide increased wear resistance and life, but they can lose geometric quality. This is due to distortions induced due to the various heat treatment processes. Regardless of the method of heat treatment, geometric distortions must be corrected in a finishing process to achieve the necessary gear quality. These finishing processes can be divided into two categories: 1) undefined cutting edge operations, such as grinding or honing; and 2) defined cutting edge operations, such as hard hobbing or skiving. In this issue, we will be discussing the latter type. Skiving is the carbide rehobbing of a heat treated gear. Both coarse- and fine-pitch gears can be hard-hobbed. (“Skiving” technically refers to this process when using a negative rake angle hob, which is typical for coarse-pitch gears. The gear industry commonly refers to all types of hard hobbing as “skiving,” so we will use the term as such.) The skiving operation has been utilized in the United States since the 1970s; however, not until the early 1990s did gear manufacturers find it practical to skive involute gears. Many technical improvements were made around this time including higher quality tools, better carbide materials, and better tool coatings. These helped make skiving practical, but the most important technical advancement was automatic stock dividing systems on the hobbing machines. These systems assure that stock (distortion) is evenly removed from both flanks of a gear’s teeth. This is necessary to correct for heat-treat distortion and achieve the required gear quality. By using an automatic work-piece-to-cutter synchronization system (Figure 1), skiving becomes a practical process for gear manufacturers. For example, an electronic non-contact system measures a sequence of impulses on the work piece. 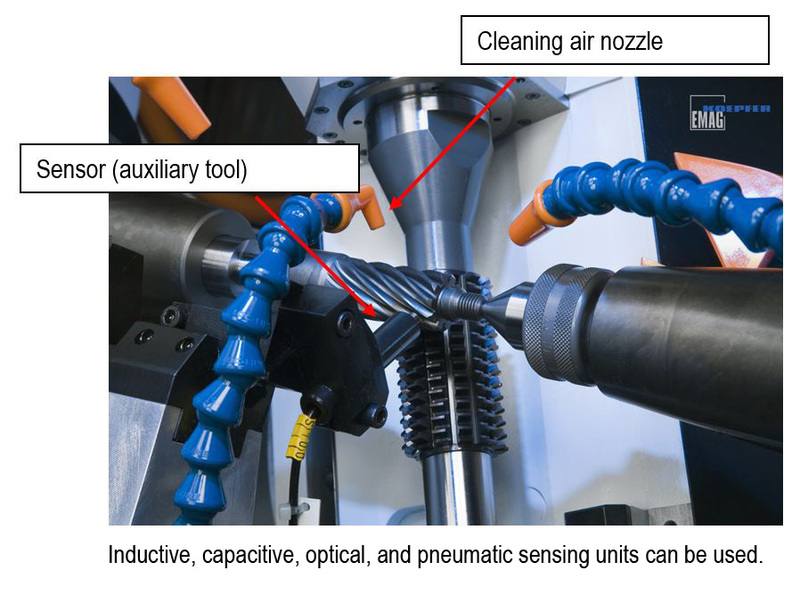 On current CNC hobbing machines, these signals are then electronically processed with the cutter spindle position, which modifies the relative position of the work spindle to accurately align the teeth of the work piece with the teeth of the hob. Without such alignment, the skiving operation would unevenly remove stock from the heat treated gear, or even worse, the operation would hob away the existing gear teeth! Provided the machine has alignment capability, skiving can be done on conventional hobbing machines (both mechanical and CNC), but the gear manufacturer must consider the machine’s static and dynamic rigidity as these directly affect the quality that can be achieved. Thus, it would be unlikely to have a high-quality gear skived on an old machine. The latest generations of CNC hobbing machines are often built with skiving in mind, so they provide the rigidity necessary to produce a high quality gear. Additionally, these machines have a precision work spindle indexing system for spacing accuracy, a rigid feed drive for lead control, and backlash-free work and cutter spindles. Simply put, a high quality machine is necessary to skive a high quality gear. Skiving can eliminate most cumulative spacing and concentricity errors due to its continuous generating action. This process is also a relatively fast finishing operation. Lastly, a properly equipped, modern, high-quality hobbing machine can not only cut parts in the soft state, but it also provides the ability to skive or carbide re-hob gears. This allows a gear manufacturer to avoid the capital costs of multiple machines. For these reasons, skiving has become a standard finishing method for many hardened gears because it provides both high quality and an excellent surface finish.